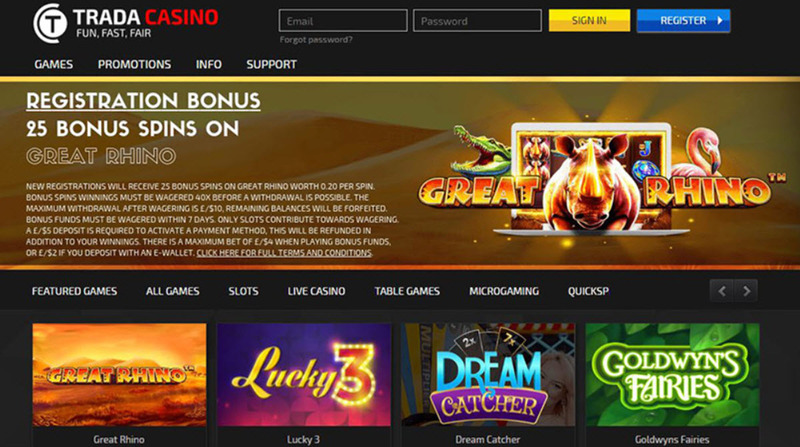 Trada Casino is an online casino with games from a lot of different game developers, from giants such as NetEnt and Microgaming to small niche developers such as Playson. The live casino is handled by Evolution Gaming. A majority of the games in Trada Casino are slots, table games or video poker, but you can also find single-player bingo games and keno games here. A downside with this casino is the lack of progressive jackpots. Trada Casino is only available in English. The casino is operated by TradaGames (Jersey) Limited, a Jersey-based company established in 2011. The operator has obtained two gambling licenses for the casino; one from the UK Gambling Commission and another one from the Jersey Gambling Commission. There are several hundred slot machines to chose among in Trada Casino, including famous ones such as Immortal Romance (renowned for its high RTP) and Dead or Alive (renowned for its high variance). The NetEnt favorite Starburst is here, as well as Microgaming’s Avalon and Avalon II. Trada Casino has a great selection of Blackjack games; both in the live casino and in the digital casino. You can also play roulette, baccarat and several types of casino poker here. The live casino is operated by Evolution Gaming and contains blackjack (45 tables), roulette (15+ tables), baccarat, and casino poker. The assortment of blackjack games is comprised of around 70 different games, including 45 in the live dealer casino. The selection of video poker games is pretty good, but we do miss Deuces Wild. There is no Trada casino app for mobile devices, but you can access the mobile casino in the web browser of your mobile device. Only a limited selection of games are available for mobile touchscreen play, mostly slot machines. If you are interested in high stakes gambling, we recommend taking a look at Baccarat Control Squeeze and Salon Privé Blackjack 3 – two tables where the upper betting limit is $10,000. For roulette players, there is the Hippodrome Casino Roulette where the limit is $5,000. The minimum deposit for these methods is just $5. The upper limit is $5,000. When it comes to withdrawals, Trada Casino distinguishes itself by allowing withdrawals as small as $10 and not charging withdrawal fees – two big advantages for the player. Withdrawals requests for Skrill, Neteller, Trustly, PayPal and EcoPayz are typically processed within 24 hours. For VISA, MasterCard and bank transfers, expect a processing time of at least two days. The upper withdrawal limits are $10,000 per withdrawal and $10,000 combined per week. Regrettably, there is no phone support. There is email support and live chat support. The support is only staffed from 09:00 to 23:00 GMT, which is adownside for players who like to play later than this and might need to get in touch with the customer support.